A recent LinkedIn article by businessman Robert Herjavec of ABC’s Shark Tank got us thinking. It was about how the new year provides an opportunity for a “new start.” A clean slate, if you will. In his words, “a chance to reset and recalibrate goals” and focus on “continuous improvement.” We couldn’t agree more. So, we thought we’d take a moment to share some thoughts on this idea of continuous improvement. And more specifically, how organizational change management supports it. By its very nature, continuous improvement implies two things. First, that there’s a goal. And second, that reaching that goal will require some amount of change or transformation along the way. This time of year, this notion of continuous improvement usually reveals itself in statements like “I want to lose weight” or “I need to work out more.” You know, those New Year’s resolutions that rage like a burning inferno on December 31 but are nothing more than a puff of smoke by the end of January. We’ve all been there, done that! Still, we feel compelled to always work toward something greater, better. And it doesn’t apply just to our personal lives. The same is true professionally. As leaders, we’re constantly looking for more efficient and effective ways of doing business. You’ve heard the rhetoric. Work smarter not harder, the pundits say. But aren’t most of us already doing that? Or at least we think we are, right? If not, does this statement then somehow imply that we’re all foolishly working our hands to the bone for nothing? Surely not. The truth is many businesses lack the right culture and tools needed to achieve success in this arena. It’s not because people don’t want to improve. It’s because they aren’t ready to embrace the change that goes along with that improvement. Think about turning on that old dusty treadmill in your basement. It’s enough to send shivers down your spine. Same goes for business transformation. This is where organizational change management (OCM) can help. As Robert points out in his recent post, the best way to predict the future is to “simply create it.” That’s right. Create it. But forging a new future comes with many different and complex challenges. Envisioning it is one thing. Achieving it is another. The biggest mistake most companies make is not managing the impact the change has on their most important asset—their people. And it happens. All. The. Time. So, what’s the solution? We suggest companies think about the role of organizational change management (OCM) on the front-end. Not as an afterthought when the whole thing is teetering on the edge of disaster. 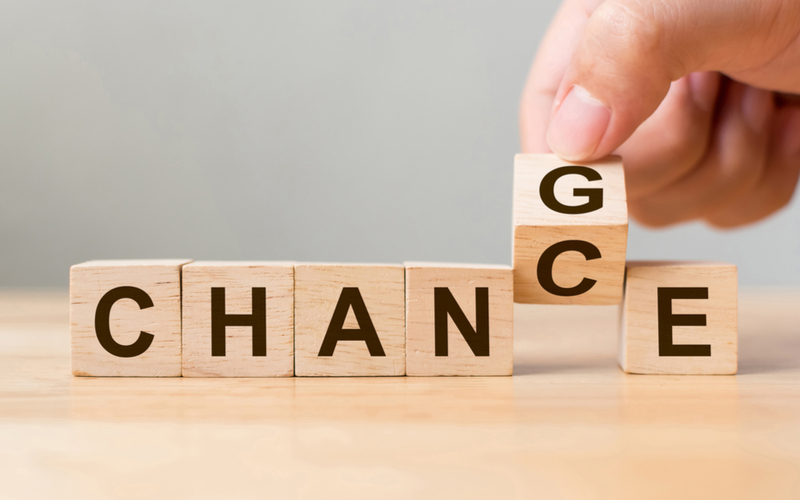 OCM is more than just “helping people through change.” It’s a structured discipline that uses various methods to manage the effect of new business processes or cultural changes within an organization. Change consultancy firm Prosci explains that, like project management, organizational change management has a set of tools. Only in this case, the tools support the people side of change versus the process side. While there are dozens of different OCM models out there, we think Prosci does a great job of outlining five main components, or levers, of OCM in this article. And, of course, we’re happy to see that communication is the first component listed. Why? Because we know from experience that communication plays a vital role in making change stick. At IronStrike, we think of organizational change management in terms of the four A’s: Awareness, Acknowledgement, Acceptance and Adoption. And we believe communication spans the gamut, serving as the golden thread that ties it all together. Because without meaningful, consistent communication, the whole thing unravels. This first stage is what some might refer to as “making the case for change.” This stage occurs when an organization first becomes aware that a change is necessary. It could be related to company culture, innovations in business technology, the introduction of a new product or service, or even a merger or acquisition. In each case, the situation has reached the point of critical mass—and something needs to give for the business to continue to thrive. It’s during this phase that the problem becomes clear. It’s the shared need. Or the urgent business matter that you can’t ignore. It’s the constant desire to buck the system or find workarounds. All of it points to an obligation to do something different. And communication is at the very core. It starts out as nothing more than a whisper in the hallway or break room. People start talking about what isn’t working. Or what could be better if something were different. They begin wondering what the future holds after they’re merged with that other company they’ve heard about. They’re nervous about adding a new product or service when they perceive they don’t have the resources they need to sell the existing ones. These whispers can quickly turn into choruses of conversations. Forward-thinking organizations can seize these opportunities and morph these conversations into focused dialogue about activities or actions they can take to change course—for the better. These are the seeds of a change strategy. Aware, but are you ready? Awareness is important, yes. But even more important is knowing if you’re truly ready. This is the time when organizations can use OCM tools to assess an organization’s readiness for change. As we mentioned earlier, it’s not that people don’t want something better. It’s that they fear the unknown. Thus, they resist change. So, use this time to name the issue—and explain how a change can help the organization move forward in a different way. Don’t forget to address individual concerns as well, like how a change will impact specific sets of employees. Once you’ve identified a change initiative, the goal is to move to the acknowledgement—or acceptance—phase. This is about helping employees overcome resistance to change so they can become engaged in and support it. In other words, getting individuals to acknowledge that the change is real, so they get on the bus. A big part of this is identifying an executive sponsor who will help rally the troops during the period of change. Of course, communication plays an integral role. Your sponsor is the one who’ll share the vision for the desired future state. He or she will paint a picture of what the future looks like and explain how it’s different than what exists now. This person will set expectations for how individuals and the organization overall will act and speak in the future. What’s crucial here is making sure you have a communications plan in place so that the right messages reach the right people at the right time. It’s not a one-size-fits-all model. You should tailor messages to the audience and detail the impact the change has on each individual or employee team. Alignment is the next step or phase. When individuals in your organization accept the change, they essentially agree to align themselves with the new way of doing business. This is the stage in which you gain commitment from people. Notice that we didn’t say these people were taking action just yet. Actual implementation of the change comes in the next phase, adoption. Communication plays an important role in this phase, too. Talking about how the change will improve a situation or highlighting “the gap” can sometimes be the tipping point for people. Individuals will be more accepting of change when they believe that the pros outweigh the cons. So, highlight the positives and show how the change benefits staff or customers. And remember, the more people who “get on the bus,” the more brand ambassadors there are to help bring some of the naysayers or dissenters along. Adoption occurs when individuals within an organization fully engage in the change and you see this in their behaviors. It’s important during this phase to continue to reinforce the “why” behind the change. It’s equally important to make available ongoing training and support for new and existing staff. Communicating victories and providing a feedback loop are also crucial elements during this stage. Bottom line: Use communications during this phase to help make the change stick. Most of us recognize the value of organizational change management in the business world. But, in case you still aren’t sold on the idea, we’d like to leave you with a slightly humorous reminder of what happens when you’re missing an important part of the change equation. Hopefully this helps demonstrate why it’s important to have a handle on change, lest it manhandle your organization and employees. Though we’re not certain who the authored this equation, it’s simply too good not to share. The information we’ve outlined here is just the tip of the iceberg. There’s so much more we could unpack about OCM, but we’ll save that for a future blogpost. In the meantime, if you need help with OCM, check out some of the services we provide. Now let’s go jump on that dusty old treadmill and get a move on! Cheers to a great year!